Researchers found that the sun-like star Kronos likely consumed 15 Earth masses' worth of rocky planets. Researchers named the star Kronos, after the Titan of Greek mythology who ate his own children out of fears they'd dethrone him, according to a statement from Princeton University. Kronos belongs to a binary star system, or double-star system, located 350 light-years from Earth. Most metal-rich stars "have all the other elements enhanced at a similar level, whereas Kronos has volatile elements suppressed, which makes it really weird in the general context of stellar abundance patterns," Semyeong Oh, a graduate student at Princeton and lead author of the study, said in the statement. The abundance of rock-forming minerals was concentrated in Kronos' outer layers, rather than mixed throughout the star. Furthermore, the researchers confirmed that the types of minerals in the outer layers of the star solidify at warmer temperatures — a characteristic of rocky planets, which form closer to their parent star than gas giants do. Kronos and Krios, as recorded in the Space Telescope Science Institute's Digitized Sky Survey. "All of the elements that would make up a rocky planet are exactly the elements that are enhanced on Kronos," Oh said. "And the volatile elements are not enhanced, so that provides a strong argument for a planet engulfment scenario, instead of something else." 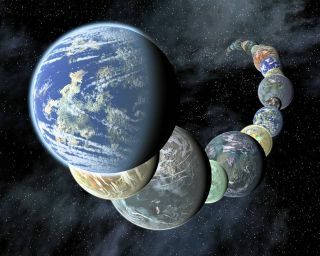 "At the moment, we are still at the stage of piecing together different observations to determine how and when exoplanets form," said Jessie Christiansen, an astronomer at the NASA Exoplanet Science Institute at the California Institute of Technology who was not involved in the research. "It's difficult to directly observe planet formation around young stars — they are typically shrouded in dust, and the stars themselves are very active, which makes it hard to disentangle any signals from the planets," Christiansen said. "So we have to infer what we can from the limited information we have. If borne out, this new window onto the masses and compositions of the material in the early stages of planetary systems may provide crucial constraints for planet formation theories."